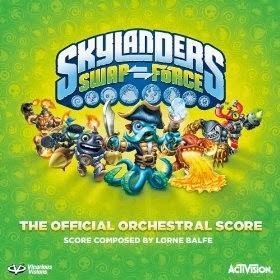 Composer Lorne Balfe (Salinger, Assassins Creed III, Skylanders: Spyro’s Adventure and Giants,) returns to the Skylands with the soundtrack for Skylanders: Swap Force. The soundtrack is currently available digitally through all major providers in advance of the release of the Activision game on October 13th. Said Balfe "Working on Skylanders is like being on a sugar rush for 3 months straight! We are so happy to have been a part of another great game by Activision." ABOUT SKYLANDERS: SWAP FORCE: Embark on an exciting new adventure with the Skylanders and the SWAP Force. For generations, the SWAP Force protected the volcano that replenishes Skylands’ magic. That is until an epic battle caught them in an eruption that blasted them apart, sent them to Earth and gave them the ability to swap powers. Only you can mix and match their tops and bottoms, put them on the new Portal of Power™ and save Skylands.